Natural DIY Car Air Freshener - Oh, The Things We'll Make! Keep your car smelling fresh with this easy, natural DIY car air freshener using the essential oils of your choice. Many artificial fragrances either make me nauseous or make it harder for me to breathe (I have a history of asthma). So, even before knowing that artificial fragrances could be potentially harmful, I've never been one to have one of those cardboard pine trees hanging from my car's rear view window. One of the main reasons that I started making a lot of my own natural products was to avoid the artificial fragrances used in most products. Unfortunately, the ingredients in fragrances don't need to be disclosed, despite the fact that it is becoming more apparent that many of the commonly used ingredients can be detrimental to our health. Often, I'll find a product with ingredients that don't look too bad to me, but then there's the “fragrance” enigma in the ingredient label that has me wondering if I should buy the product or not. I have also noticed when looking up products in the EWG Skin Deep® cosmetic database that some cosmetics would have an otherwise reasonably safe rating if it weren't for the fragrances they use. Not being sure about the safety of most artificial fragrances, I tend to stick to either using only essential oils or using no fragrance at all when making my own products. I know that the topic of synthetic versus natural chemicals can be a heated debate. There are times, like with iron oxide pigments, that I prefer an iron oxide that has been synthesized in a lab over a naturally found one that may be contaminated with unsafe levels of heavy metals. So, no I don't think all synthesized products are “bad” and that all natural products are “good,” but that's a whole other topic for another day. In the case of artificial fragrances, I don't know enough about each type of artificial fragrance to be able to make an educated choice about which ones to use. 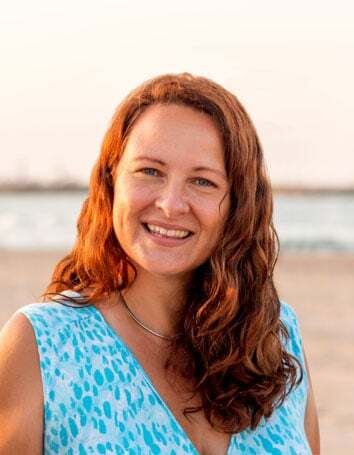 So, I choose to do what I think works best for my family, using a mixture of fragrance free and naturally fragrant ingredients when possible, and try to share my findings with all of you. I think by now you probably know that I tend to prefer the more natural options for everything I make, but my main motivation when choosing ingredients is to always choose what I think is the most safe. 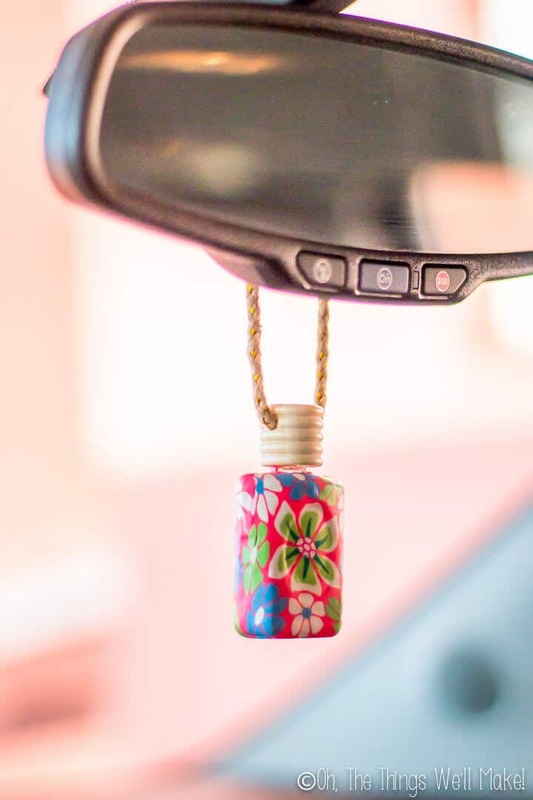 I've been using tiny glass bottles with wooden caps that can be hung on the rear view mirror for several months now. The tiny glass jars come in both plain glass and decorated varieties (I have both types), and look cute when hung from your mirror. To get the air freshener to give off more fragrance, you tip the bottle over. 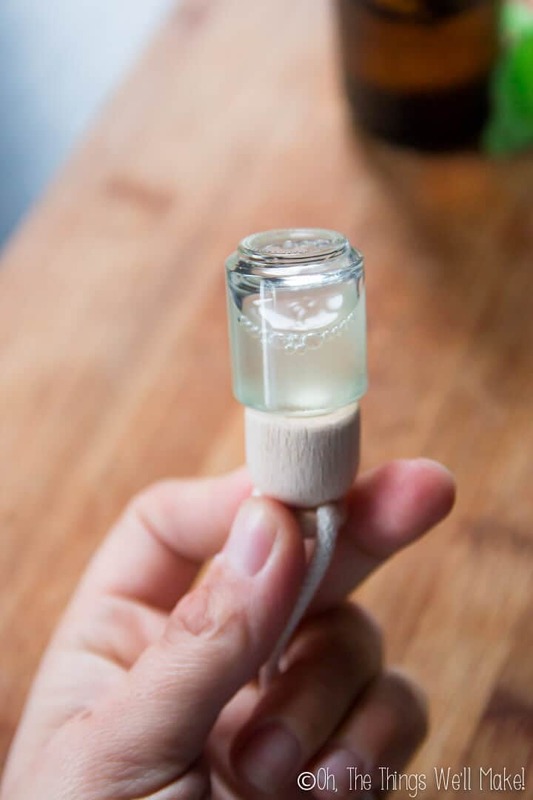 Because the cap is made out of wood, it absorbs the essential oil and alcohol mixture which then evaporates into the air giving your car a nice fresh scent. I have since seen another type of essential oil car air freshener. These vent clip air fresheners use a felt circle within a stainless steel “locket.” You add a few drops of the essential oil of your choice to the felt, and when you use your air vent, it helps disperse the fragrance in your car. While I haven't personally tried these (yet), they have really good reviews, and look pretty nice. I may have to order some soon. If you've tried them already, I'd love to hear how they work for you! For me, I'd say that the bottle lasts me a couple of weeks normally. I also have a 6 year old son who likes to tip the bottle over and have the scent be stronger. Even if you don't tip the bottle over, the oil/alcohol mixture is constantly evaporating, so you'll have a subtle fragrance in the car even when you do nothing. 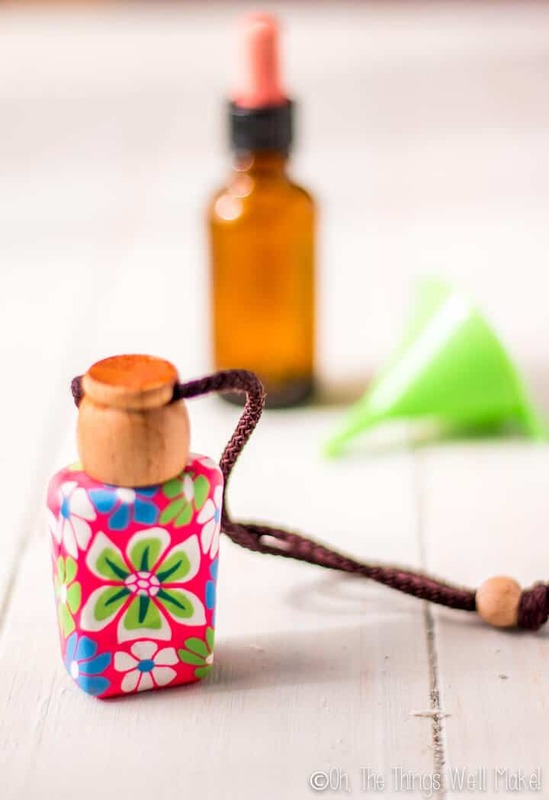 From what I've read online, the locket vent type essential oil car air fresheners last a couple of days with a couple of drops of essential oil. 5 ml alcohol denatured alcohol, vodka, etc. Open the air freshener bottle and remove the small plastic stopper underneath the cap if your model includes one. Pour the alcohol into the bottle. I've found using a small funnel helps. The alcohol should fill around half of the bottle. Since most air freshener bottles are 12ml, 5 ml is a good estimate. I started using a perfumer's alcohol (basically a denatured alcohol without much scent of its own), but that was rather expensive. I was afraid to use a denatured alcohol because I thought that its own scent would be overpowering, but in practice I haven't found it to be a problem. It works just as well. I've even tried vodka, which has also worked well and may even last a bit longer due to its lower alcohol content (meaning slower evaporation). 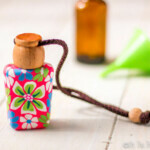 Fill the rest of the bottle with an essential oil of your choice. The instructions with the bottles I bought suggested using a 50%/50% mix, but lately I've been using a little more alcohol and a little less essential oil. I haven't found too much of a difference between how strong the scent is or how long it lasts between doing the different concentrations, so it may end up being a bit less expensive that way. Put the wooden cap on the bottle without the plastic stopper. Tip the bottle over to wet the cap with the alcohol and essential oil mixture. Hang the bottle from the rear view mirror of your car. Adjust the length of the cord in a way that keeps the bottle from hitting your windshield in case of going over bumps. Any time you need to add a bit more fragrance to your car, just tip the bottle over for long enough to wet the wooden cap again. You can use the plastic stopper under the cap to keep the liquid from evaporating when not in use. What if I don’t want to use alcohol & make car freshners out of base oil mixed with a fragrance or essential oil. If this is possible? In any case, if you’re only using oils, you won’t need to preserve. I’m just not sure how easily the fragrance will be spread. I’d be curious to hear how it goes if you do try it! What kind of essential oils did you use preferably? I’ve used lavender, orange oil, and lemon oil. sometimes I combine them. I actually quite like the combination of lavender with citrus scents. Use whatever alcohol you prefer (including any drinkable alcohol like vodka)! You’ll want to add some sort of alcohol as a carrier that evaporates and helps give off the scent of the essential oils. I’m not sure this would work without using some sort of alcohol. You could try with a carrier oil, but it definitely wouldn’t give off as much of a scent without some sort of carrier that evaporates relatively quickly. I used denatured alcohol, which is really just a strong alcohol like rubbing alcohol or isopropyl alcohol. I think denatured alcohol is a broader term and rubbing alcohol is basically a type of denatured alcohol. The one I bought here in Spain was basically like a rubbing alcohol, but they called it denatured alcohol so I used that terminology. Some denatured alcohols may be used as more of a solvent, which might be the type you saw at the store. I would think it would still work the same way. Of course, any alcohol is going to be flammable, so caution should be used around fire with any of them. hi i tried it and the mixture leaked in the car do you have a soulotion? Where, exactly, is it leaking? I haven’t had any issues with mine. The glass part should be on the bottom, and the level of liquid shouldn’t be reaching the level of the lid, so I’m not really sure how you are getting leaking unless it is falling upside down, or the level of liquid is too high. Pretty cool idea. I’m looking to make a car freshener. Great! I hope it goes well for you! Thank you so much for sharing your knowledge with us. If I have had a bad day, is it safe to drink the vodka based air freshner?? Thank you for this DIY. Can you tell me what type of denatured alcohol do you use (96 ° or 90,50) ? Wow, that sounds great!! I am going to try it. Where did you get your bottles from? I bought mine online through Amazon. I bought them from a different seller than the one linked to because we have different offerings here in Spain, but they appear to be the same type bottles and the same size. I can’t seem to find the link to the bottles on this page? Searching amazon all I’m finding is cork lid bottles! I found these bottles on Amazon. There is an amazon widget in the middle of the post with a picture of them that links to that and a few other things, but now that I look, I see it could be more prominent. I’ll try to add a better link for others who are having the same issue! Thanks for alerting me to the issue!